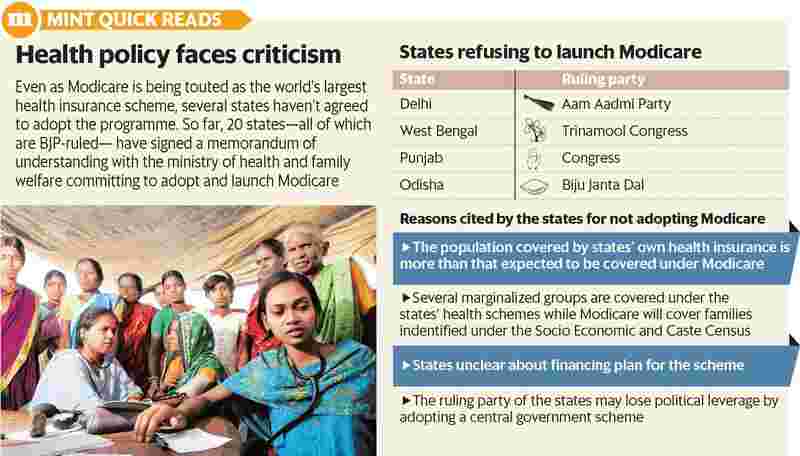 Twenty states, all ruled by the BJP, have signed MoUs with the Union health ministry, committing to launch Modicare. New Delhi: The Ayushman Bharat -National Health Protection Mission (AB-NHPM), the flagship health insurance scheme of the Narendra Modi government also known as Modicare, has found little acceptance in states that are ruled by parties opposed to the Bharatiya Janata Party (BJP). Interestingly, 20 states, all ruled by the BJP, have signed memorandums of understanding (MoU) with the Union health ministry, committing to launch Modicare. Maharashtra and Goa will also sign the agreements soon, said a ministry official on the condition of anonymity. Delhi, West Bengal, Punjab and Odisha, states with governments run by political parties opposed to the BJP, have claimed that the scheme is inadequate and that they prefer to continue with their “better" health insurance schemes covering more people in comparison to Modicare. Congress-ruled Punjab claimed the state provides insurance cover to more people through its various health schemes. It also raised some “issues" related to funding and feasibility. “Modicare covers only those families listed under deprivation categories of Socio Economic Caste Census (SECC) -2011 census data which comprise a small proportion (less than 25%) of the population of Punjab, whereas we target to universalize the health protection cover to the entire population," Brahm Mohindra, health and family welfare minister, Punjab government said in an interview. “Punjab is the first state among northern states to introduce social health insurance for general masses. Our Sanjeevani Health Insurance Scheme offers cashless tertiary care treatment up to ₹ 2 lakh to the farming community of Punjab," he said. Other schemes running in Punjab are Mukh Mantri Punjab Cancer Raahat Kosh scheme giving financial assistance up to ₹ 1.50 lakh for cancer patients from Punjab. Mukh Mantri Punjab Hepatitis C Relief Fund Scheme, offers free treatment of Hepatitis C. “Bhagat Puran Singh Sehat Bima Yojana offers plethora of social benefits to around 30 lakh families of Punjab. These benefits are cashless health insurance cover of ₹ 50,000 per annum per family and accidental death and disability insurance cover of ₹ 5 lakh to the head of family," said Mohindra. Similarly, West Bengal, which has one of the best healthcare insurance models in the country, has not shown any interest in adopting Modicare. West Bengal has a group health insurance scheme named “Swasthya Sathi" launched in 2016. The scheme offers basic health coverage for secondary and tertiary care up to ₹ 1.5 lakh per annum per family through insurance mode and up to ₹ 5 lakh for certain critical diseases like, cancer, neuro-surgery, orthopedic and cardiological diseases, among others, through assurance mode under the umbrella of Swasthyasathi Samiti. All pre-existing diseases are covered from the first day of the policy. “The central government is replicating our model. In fact, they called our representatives to help in the AB-NHPM. In our scheme, we have covered unorganized sector, self help groups, Accredited social health activists (ASHAs) as well. We are not only giving people health insurance but empowering women also. Parents of both the spouses are eligible under our own scheme," Chandrima Bhattacharya, minister of state, West Bengal government, said in an interview. “Our health insurance scheme is best suited for our people. So far, we have not done any deliberations to adopt AB-NHPM," she said. Modicare, touted as the world’s largest health insurance scheme, aims to provide free health insurance of ₹ 5 lakh per family to nearly 40% of the population, or more than 100 million poor and vulnerable families. Delhi government finds Modicare unsuitable to the urban nature of the national capital. “Firstly, the scheme needs political commitment for its implementation. Any state that adopts a central government scheme will carry the brand value of whosoever launched it. Here is the biggest challenge," said Dr. Kirti Bhushan, director-general of health services, Delhi government. “Moreover, AB-NHPM lacks a basis on which we should adopt the scheme. There are certain good pointers in AB-NHPM but majorly, it will not benefit the Delhi population. Delhi has majorly urban population. Total population of Delhi is 1.8 crore. As per SECC 2011, the criteria for AB-NHPM, Delhi has only 20 lakh persons eligible for the health scheme which is only 15% of the total population," he said. On similar lines, having apparent reservations against Modicare, Biju Janta Dal-led Odisha government has argued that in AB-NHPM, the state is required to pay 40% of the total funds required while the centre will bear 60%. Odisha will require contributing ₹ 400 crore every year to AB-NHPM, a major part of which will go to the insurance companies. Instead, the state will spend approximately the same amount or even less in its own new healthcare scheme, Biju Swasthya Kalyan Yojana (BSKY), which covers more families and get 100% credit for it as a state government initiative. BSKY is expected to be rolled out on 15 August at the same time when Modicare may be launched, offering up to ₹ 5 lakh health assistance in empanelled hospitals to 7 million families. “AB-NHPM will cover maximum 61 lakh families, leaving out 45 lakh people of nine lakh families. We don’t want to deprive such a large section of people from better healthcare by implementing AB-NHPM," Pratap Jena, health minister of Odisha said.